Fitted sleeveless bodice. Full pleated skirt with contrast band at hem. Center back zip. 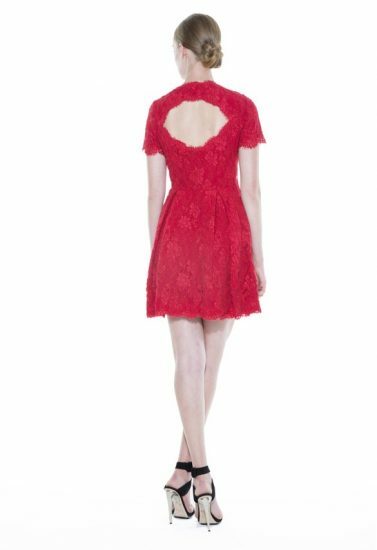 The perfect lace dress. Bodice fitted to highlight natural waist. Skirt fitted to low hip then flares out drastically. Scalloped hem. Green; Available in multiple colors. French lace; lining: silk charmeuse. Sleeveless fitted bodice with modified racerback shape. Full skirt that hits just below the knee. Lining is shorter than dress for peek-a-boo effect. 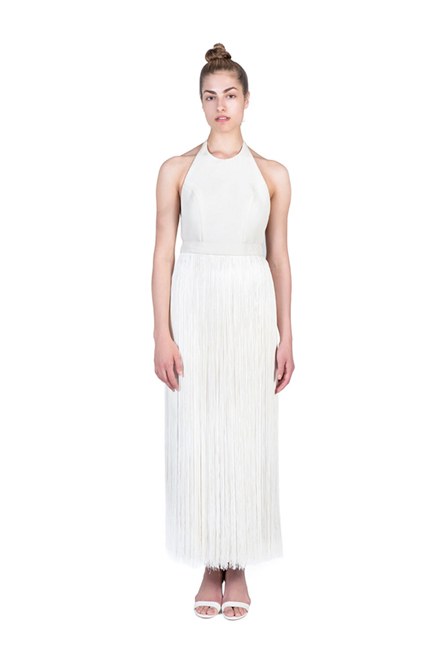 Three-piece look: halter neck bodice with low back & fringe detail at waist seam; worn over our Whitney Short; completed with belt with additional fringe detail. Sleeveless v neck fitted dress that flares at low hip. Center back zip. Belt not included. 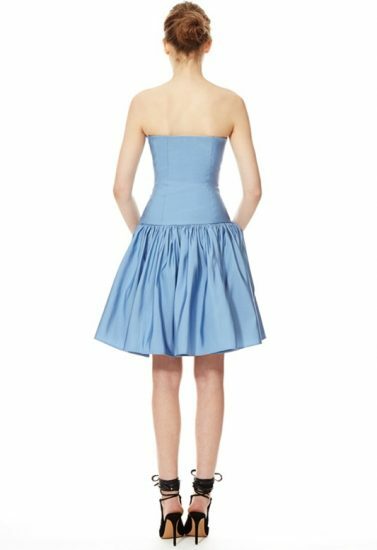 Fitted bodice with high neckline and no back. 2 inch wide cross back straps. Fitted skirt with ruched seam at hip. Side zip. Fitted bodice with modified racerback shape & center back zip. Fitted skirt with ruched seam at hip (shown with removable belt). Short sleeve v-neck dress with fitted bodice to low hip & exaggerated flare bottom. Hits just above the knee. Center back zip. Fitted sleeveless bodice with plunging v neck. Full pleated skirt that hits at mid thigh. Center back zip. Belt not included. Leather & piqué; silk charmeuse. Extra low v to the waist with fitted bodice & no sleeves. 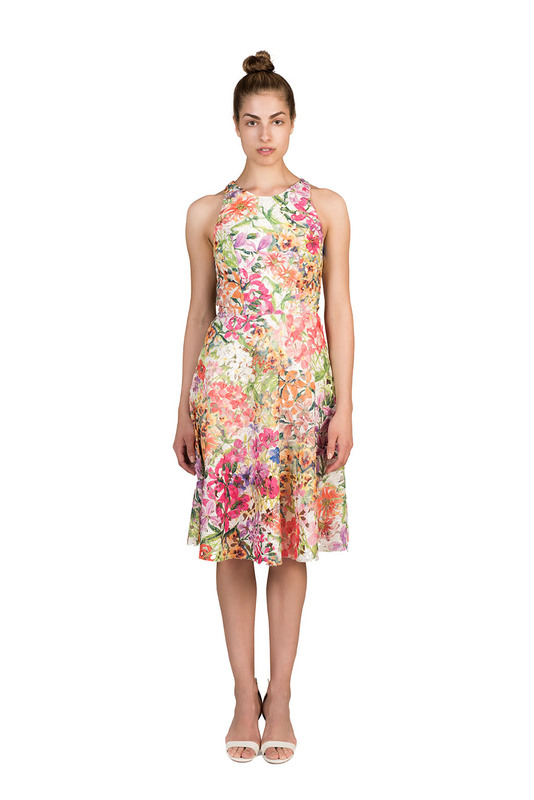 Hand-placed & sewn silk embroidered floral detail. Full pleated skirt that hits below the knee. Center back zip. Fitted bodice with v-neck & short sleeves. Full pleated skirt that hits at mid thigh. Center back zip (shown with removable belt). 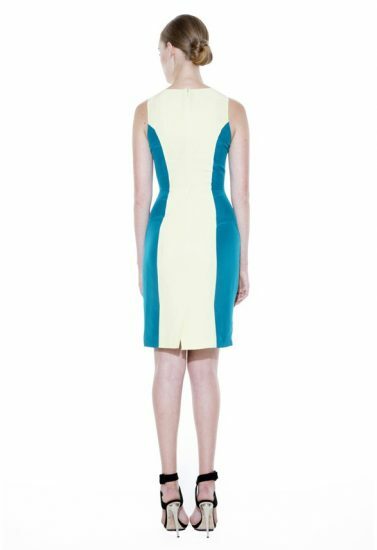 Sleeveless scoop neck dress with fitted bodice. Full skirt to the knee and center back zip (shown with detachable belt). Sleeveless mini dress with bell-shaped skirt and modified racerback. Shape designed for dancing- hem doesnÕt move with arms. Hand-sewn floral embellishment around neck. 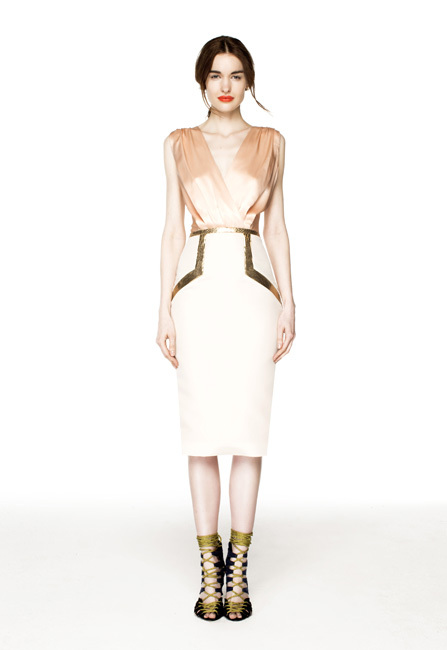 Extra long version of our sleeveless mini dress with bell-shaped skirt & modified racerback. Shape designed for dancing- hem doesn’t move with arms. Red; available in multiple colors. Crew neck dress with short sleeves. Fitted to the high hip with full skirt to knee. Center back zip. Fitted bodice with deep v neckline. Skirt fitted to low hip then flares out drastically. Scalloped hem. Relaxed fit faux wrap sleveless top. Pencil skirt with contrast leather banding. Center back slit & side zip. 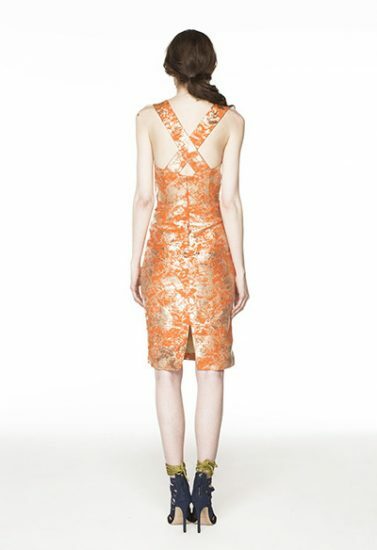 Silk charmeuse; silk faille; metallic python. High v-neck dress with cut-out shoulders & center front & back slits. Semi-relaxed fit with hem that hits just below the knee. Center back zip. Fitted bodice with high neckline & bubble hem. Center back zip. 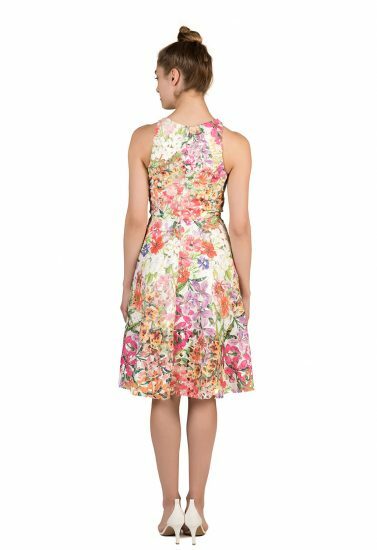 V-neck sleeveless dress fitted to the hip with full circle skirt. 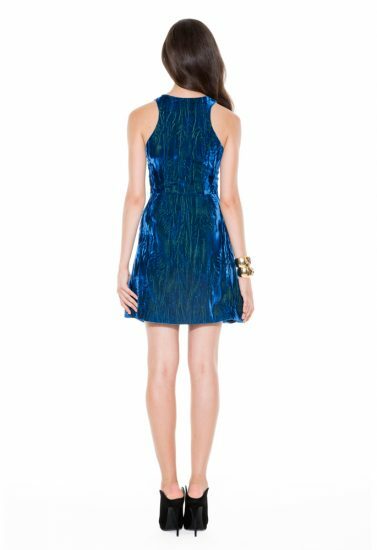 Made with floral sequins & crystal fabric. Center back zip. 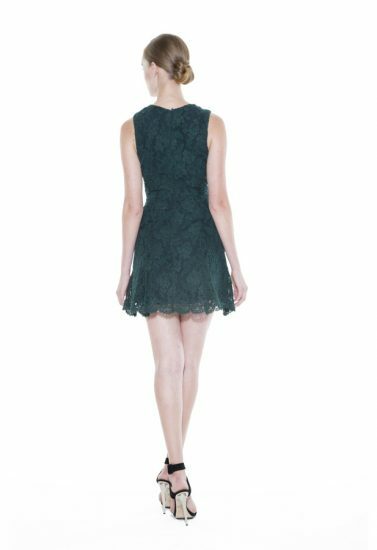 Short sleeve high neck dress with an unlined lace top that goes into a leather bodice & skirt. Leather bodice has semi-sweetheart neckline. Full skirt to mid-thigh with center back zip. 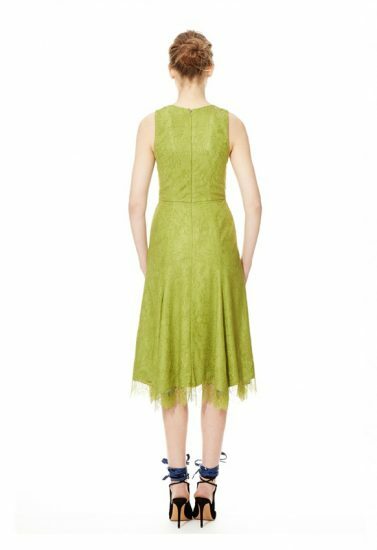 Updated version of our classic Crosby Dress with portrait neck & cap sleeves. Bodice fitted to highlight natural waist. Skirt fitted to low hip then flares out drastically. 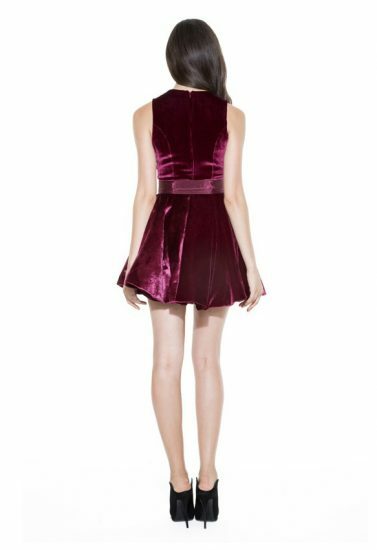 Scalloped hem & center back zip. Boat neck dress with short sleeves & low v back. Skirt fitted to low hip then flares out drastically. 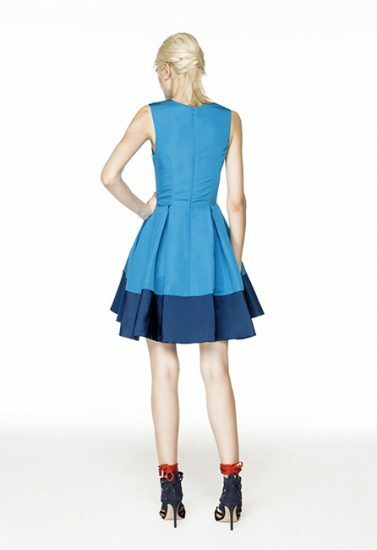 Scalloped neck, arms & hem with center back zip (shown with detachable belt). 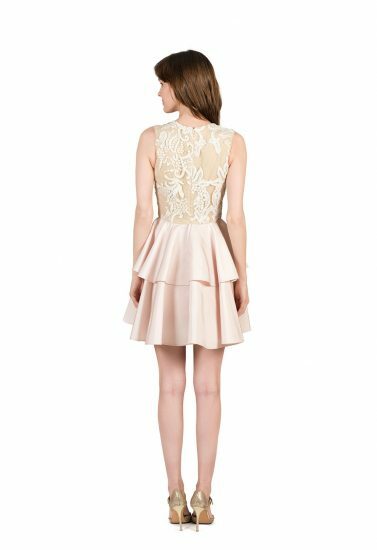 Cap sleeve lace dress with full pleated skirt. Fitted bodice with scalloped V-neck button down front and open back. Hem hits mid thigh. 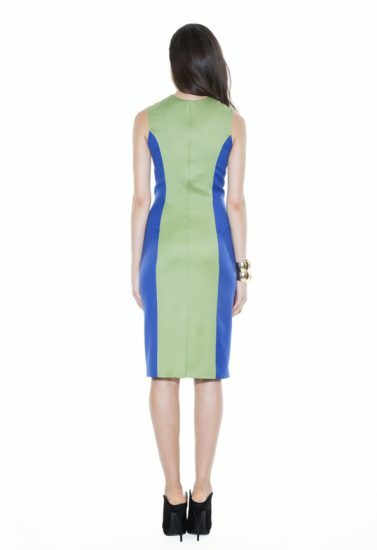 All leather dress with a fitted bodice to highlight natural waist. Skirt fitted to low hip then flares out. Center back zip. V neck leather dress with short sleeves and ruffle at low hip. Center back zip. Fitted dress that falls just below the knee. Portrait neckline with center back zip. 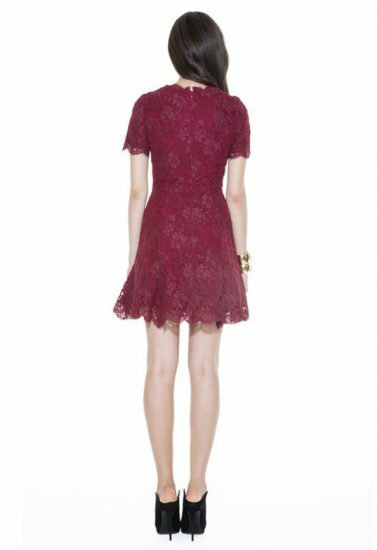 Fitted, knee-length lace dress. Princess seams used to create slimming illusion through contrasting colors. 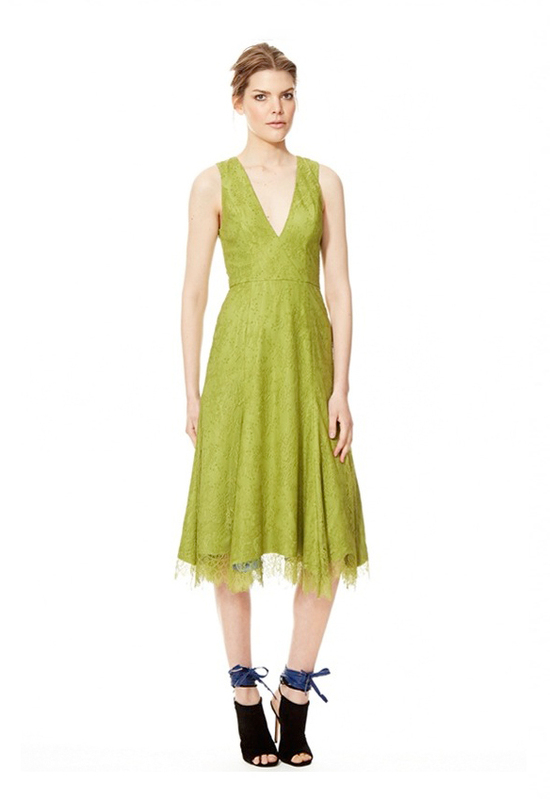 Sleeveless dress with exaggerated ruffle detail on straps. Low scoop neck & dress hits at mid-thigh. Center back closure. Semi- sweetheart slight scoop neck with boned-bodice. Ruffle off the shoulder sleeves. Fitted shape to below knee. Center back zip. Off the shoulder semi-sweetheart neck with boned fitted bodice. Skirt fitted to knee then flares to mid-calf. Center back zip. Cherry tomato; available in multiple colors. Strapless dress with built-in boned corset. Fitted to low hip then heavy ruching to mid thigh. Pockets on hip & side zip. Strapless very fitted dress to knee. Corset with boning underneath for support. Side zip. Sleeveless crewneck bodice with hand-placed beaded detail. Two tiers of ruffles that hit mid-thigh. Center back zip. (Can add detachable skirt to make a gown). Scoop neck front with wide straps & low back. Three tiers of ruffles that hit just above the knee. Center back zip. Relaxed fit faux wrap bodice. Short sleeves with button closures at back. Fitted skirt with ruffle detail. Side zip. Belt not included. Button down fitted shirt dress with flat a-line front & full paneled back. Collar neck with cuffed arms & cut-out back. Hits mid-thigh. High crew neck dress with unlined lace long sleeves. Hem hits mid-thigh. Relaxed fit with side zip. 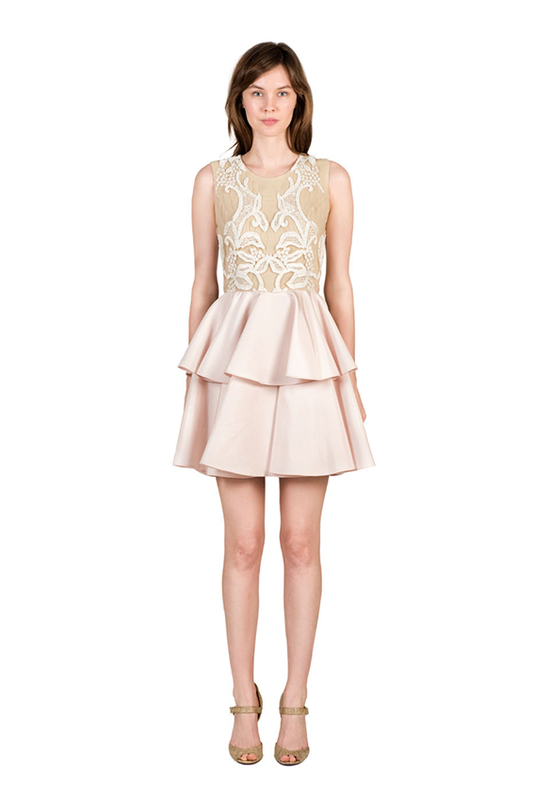 One shoulder dress with lace bodice and peplum with scalloped edge. Fitted skirt to the knee. Red/Navy/Gold; Available in multiple colors. French lace; silk/wool blend; silk charmeuse. 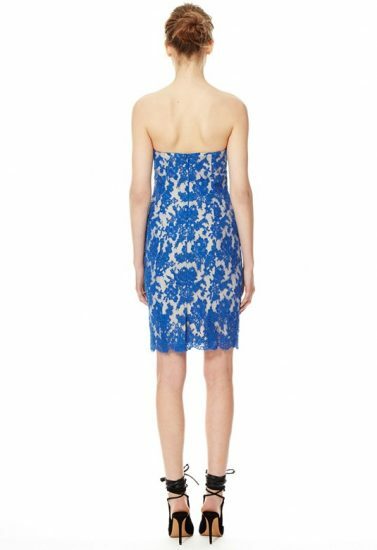 One shoulder lace dress with fitted bodice & skirt. Ruffle neck. Side zip (shown with detachable belt).